An intelligent cinema is one, which entertains and invokes a viewer to reflect on what the viewer saw, long after the film ends –extending the entertainment value, Synonymous to this definition Rahat Kazmi’s film Identity Card is based on the quandary faced by natives of Kashmir regarding the proof of their identity. The film recently won three international awards at THE SAN FRANSCISCO GLOBAL MOVIE FESTIVAL (America) including BEST FILM,BEST DIRECTOR and BEST SUPPORTING ACTOR, The film is releasing on 29th August in 48 countries. Identity Card is an independent film, which has so far travelled internationally and applauded as well. 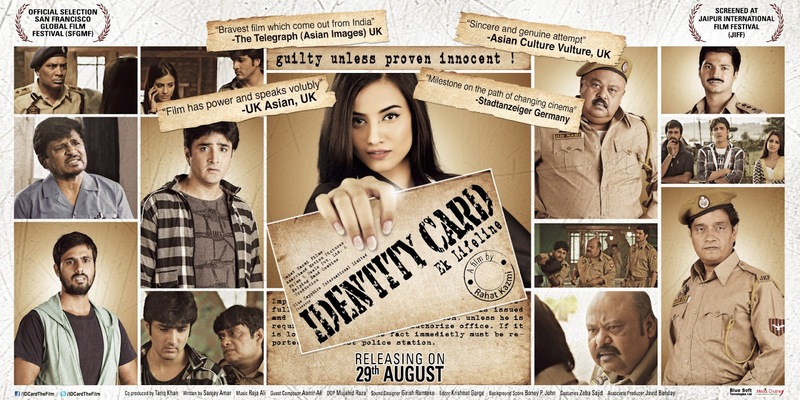 The Telegraph (Asian images) of UK quotes “Identity card is the bravest film which has come out of India in recent times”. A German newspaper critics it as “milestone in the path of changing cinema in India’ and Aseem Chhabra- a famous film critic and director of NEW YORK INDIAN FILM FESTIVAL reviews the film by quoting it as ‘An important film that explores the complexities of the Kashmir situation with a touch of humour and irony!" The satirical story of the film puts a question mark on the governing system of the ‘Kashmir’ by showing the problem of identity crisis which folks who have been living over there since decades are suffering and sadly who are engraved too. The blood on the streets of Kashmir gets reported in the parliament, gets a fire in the neighboring country but what about the blood which boils in the heart and gets stoned there itself on the regular terrifying question of identity and its die hard proofing. Saurabh Shukla recently won best supporting actor award for his performance in Jolly LLB and he is equally enthusiastic about Identity Card; this is a film from heart and it touches the hearts no matters whoever you are, Smiles Saurabh Shukla and his eyes start shining while talking about his experience while meeting people of Kashmir during its shooting. Identity card’s another screening was hugely applauded at Germany. A local newspaper from Germany writes “GRITTY, POWERFUL and humorous at parts with no compromise” We are invited for screenings from Holland, Toronto, Karachi and other parts of the world, confirms one of the producer ‘’ There are some scenes of torture which reciprocates the reality of the state giving the viewer goose bumps but at the same time it is worth watching the film experiencing the beautiful live scenes of paradise on the big screen, the comic element adding the true flavor of entertainment and chenille acting of the actors like Saurabh Shukla, Raghuveer Yadav, Brijendra Kala, Vipin Sharma, Prashant Kumar, Furqan Merchant and Shoib Kazmi”, adds Tia Bajpai, the actress of the film.